While listening to this CD I keep getting drawn back to the most recent conferences, all of this music feels familiar and generates that same feeling that we felt during the conferences. All the big finale pieces are on there, so uplifting and inspiring. They almost sound different. Exciting times and this CD reflects it. Although I love Brother Wilber's orchestral arrangments, I don't like the direction the choir has followed in the past couple of decades. The choir is capable of much more. There is way too much singing in unison under Brother Wilberg; and the words -- esepcially from the women -- have become mushed -- so much so that without already being familiar with them, you can't understand them -- even with excellent hearing. Beyond that, the orchestra nearly always overpowers the choir. I have sung nearly all my life, and my high school choir director was a former assistant director for the Tabernacle Choir. He always instructed us that instruments are more powerful than human voices and should typically be subordinate in a choral work. Brother Wilberg has obviously not learned this. I was really excited when the Orchastra at Temple Square was formed because of the opportunities I thought it would provide to enrich the audience's choral experience, but I have been greatly disappointed over the years to see Brother Wilberg's orchestral arrangments take precedence nearly all of the time. Please fix this! Love the new direction of the choir and the new sound. You can actually hear most of the words on this album. It is a very beautiful and inspiring album. I have always loved listening to The Tabernacle Choir at Temple Square. 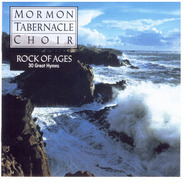 This collection of hymns is soothing and one that I have listened to over and over. It brings peace to my soul.